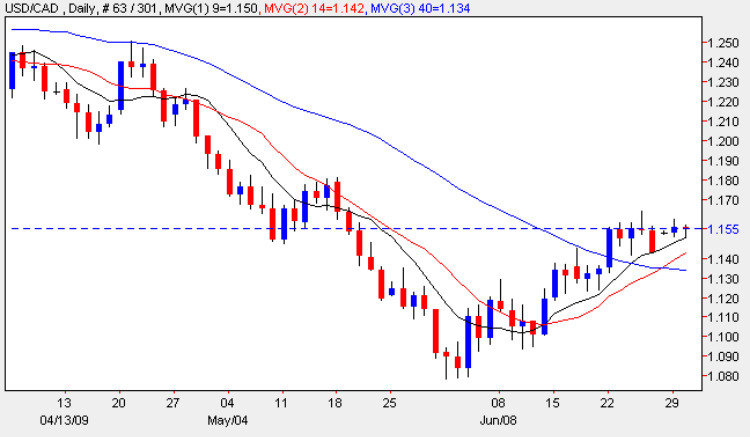 The usd to cad pair is currently finding it hard work to break through the 1.16 price region and for the sixth day in a row the closing price of the day failed to hold above this technically important level. Whilst the moving averages are suggesting a move higher, particularly with the 40 day having crossed the 14, until we see a definitive break from the current trading level at 1.1580 then the sideways consolidation will continue. The resistance level now in place between 1.16 and 1.17 may prove to be the graveyard for this particular rally, but much will, of course, depend on the fortunes of the US Dollar on Thursday following the collision between the NFP data and the ECB interest rate decision and statement. Technically the Dollar Index daily chart is currently looking weak although, of course, this could change in the blink of an eye should the NFP numbers be better than expected with a consequent shift in sentiment for both equities and commodities. Meanwhile for Canada today saw the release of the monthly GDP figures (to my knowledge Canada is the only country in the developed world to release GDP on a monthly basis) and again this showed a contraction once again of 0.1% in April, the 9th straight decline. This adds weight to the evidence that the world’s 8th largest economy extended its contraction as the global slump further reduced demands for Canada’s exports with the economy shrinking at an annualised rate of 5.4%, the biggest fall since 1991. At the same time the RMPI data was released which measures the change in the price of raw materials purchased by manufacturers and this came in at 2.2% against a forecast of 2%, largely as a result of the rising price of crude oil.